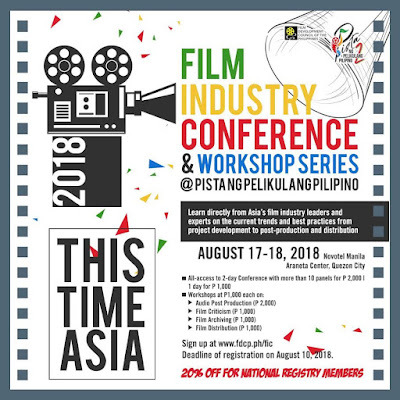 The Film Development Council of the Philippines (FDCP) is once again holding the Film Industry Conference (FIC), this time focusing on the Asian film industry and how films can cross over and form partnerships with regional counterparts. 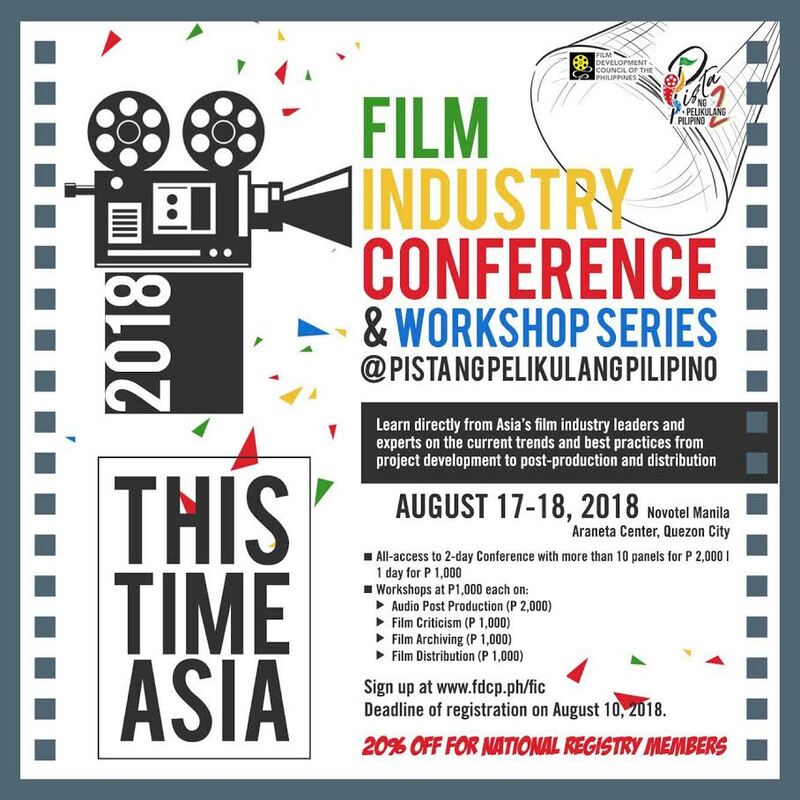 FIC will be held on August 17-18, 2018 at Novotel Araneta Center, Quezon City with international experts and Asian film industry leaders to talk about international film funding, co-production, and distribution. Workshops on special topics will also be conducted for a limited number of participants. Asia is one of the fastest growing markets when it comes to the consumption of filmcontent. This keynote address from Disney Asia will focus on the status and insights when it comes to the marketing and distribution of audiovisual content in the region and how local industries can adapt in this current market. Edgar Tejerero | Managing Partner, Fulcrums Asia, Inc.
We start with the current state of the Philippines film industry through numbers and how it is changing and adapting when it comes to the production, release, and distribution of films, and how the audience is consuming both local and foreign audiovisual content. In Asia, there is growing support for the development and production of quality and unique Asian content that diversifies the region’s cinema in the form of film funds and labs. This panel will introduce filmmakers to these available opportunities in Asia - rules, regulations, and industry practices - that could help them develop a more effective strategy of financing their projects. With the current trend of globalization even when it comes to film production, international co-production is a viable opportunity for Filipino producers to explore not just for financing their projects, but also in accessing foreign markets and diversifying and enriching their film’s content. In this panel, Filipino producers and their international partners who have co-produced projects will share their journeys and insights as they entered into international cooperation. Even with a great and unique story, one cannot begin to hope to cross over his or her film to international festivals and distribution platforms without considering first the technical requirements for production. Post-production experts on this panel will discuss international technical standards for films and how to implement effective strategies to meet them and ensure the quality of one’s final output. With the changing market everywhere in the world for Asian content, Speaker of this panel will discuss what kind of stories, themes, and film genres work today, giving the audience insights on how to move forward for future projects targeted for the international scene. With more and more Filipino projects being filmed around Asia, this panel brings togetherAsian film commissions who will introduce incentives, services, and opportunities for partnerships to bring more productions to their sites and diversify Filipino films with more locations. With the overwhelming competition from Hollywood and Western films, international distributors featured in this panel will discuss the challenges of distributing Asian films to the international market and how they selected films that have crossed over successfully. Singaporean film APPRENTICE by Boo Junfeng premiered at Cannes Un Certain Regard in 2016 and has gone on to 80 film festivals, including Toronto, Busan, Sydney, London and Chicago. It won the Grand Prix for Best Film at Fribourg, and was awarded Best Editing at the Asian Film Awards, as well as other major prizes in Busan, Taipei, St. Louis, Hawaii and Qcinema, among others. Producer Raymond Phathanavirangoon shall go in-depth into how the film, which is a Singapore, German, France, Hong Kong and Qatar co-production, came about, from its genesis, development, funding, shooting and festival strategy, highlighting along the way the responsibilities of the producer during the whole process. Alternative distribution platforms continue to penetrate the film market in Asia. Representatives from these most promising platforms discuss how it is changing the culture of consuming content and their direction for the future of distribution. This workshop introduces the filmmaker to the business of film. For a filmmaker, knowing how to market and sell your film is just as important as writing and directing it. By understanding the global marketplace, the filmmaker will gain a better understanding of what sells around the world through marketing and distribution and thus learn to tailor their script earlier in the development process. Film criticism is taking on a new form as it evolves in the era of digital media. This workshop hosted by Maggie Lee, Chief Asia Film Critic of Variety, will take on fifteen (15) aspiring and early career participants who have published reviews of feature length films. The workshop will offer tips on improving writing technique, film appreciation (eg. how to analyze genre and style) as well as ways to stand out as a writer on cinema. Each participant is required to submit a review sample of not more than 800 words on a Philippine or Asian film at least one week in advance. WhiteLight Post is one of the most prominent go-to post production houses in Asia, having most recently worked on the Academy Award Best Picture Nominee Call Me By Your Name. With this Workshop, Lee Chatametikool, will discuss the audio post process, its elements and complexities and how it figures into the overall workflow of post-production. This 1- day workshop is open to early stage professionals, producers, and filmmakers who would like to know more about how to effectively go through the post-production stage for their films. The realization of the value of film to create historical record is not a recent phenomena, it was first raised over 120 years ago, less than 3 years after the creation of cinema itself. This workshop will look at the history of film archiving and how successful it has been in protecting and preserving the creative and historical record in the world and in ASEAN countries. It will ask why so much of cinema’s past is lost when its significance was realised so soon. Through an examination of the changing technology of film production from the 1890s to the 2010s it will look at the lessons learnt and the mistakes made in those times. As filmmakers it is important to understand how you can work with film archives both domestically and internationally to access content as well as to preserving your creative works. Addressing the commercial pitfalls of technical obsolescence suggestions will be given whereby your creativity can be preserved for generations to come.